Hello I’m Richard Brown, President of ReaMark. 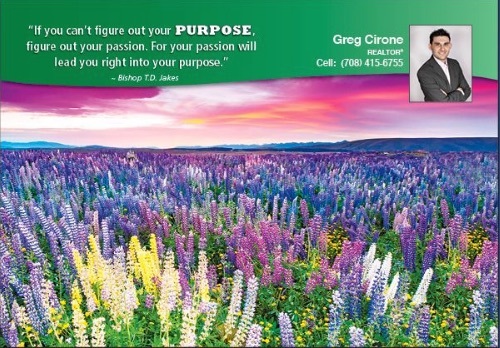 I have been in direct marketing for over 30 years with the last 18 years helping real estate professionals like you, to substantially increase their listings, sales, and ultimately, their income. There has never been a better time to improve your business by using a consistent strategy to contact anyone who knows you and can refer clients. All signs are pointing to a steady rise in the real estate business since interest rates are at record lows. In addition, home inventory is still low so listings are being sold quickly and for top dollar. So, last week I sat down, got away from the kids, and really thought about all of the success stories, trials and errors that realtors have told me during the past two years. With all being equal why are some realtors more successful than others? How can my business survive when I have less money to spend because I am making less money? One fact that kept coming up is that my business only makes money if the programs we recommend to you makes YOU money. To that end, I came up with a few things you should be doing if you are serious about increasing your yearly income. You MUST reach out to your Past Client contact list at least every month. Over 50% of your business should come from referrals. If you are not mailing to this specific contact list you are losing money. Your Past Client contact list should includes your colleagues, past buyers and sellers, friends and family. The larger the list, the more successful you will be. You really need to sit down and put this lists into a workable database. Announce your success! Since referrals are the largest part of your business and you want to build up your contact list, these are the second most effective tool at your disposal. You should mail the entire neighborhood and also your current contact list. Our Just Listed/ Just Sold, Market Updates and Open House postcards are a great way to showcase the strength of your business. If your budget is limited, these could be part of your planned monthly marketing, but for maximum results, you should be doing these mailings in addition to the ones you send out to your Current Contacts. The beauty of direct marketing is that is affordable and track able. If you have 400 contacts, you could be mailing them twelve times per year for as little as 47 cents each or $188 per month. One sale and you’ve paid for the entire year! A business with no prospects will die. You need a reliable, consistent source of leads. Since most consumers perceive all real estate professionals to be pretty much the same you must find ways to differentiate yourself. I get calls every day from past customers offering thanks for orders placed two years ago. These agents and brokers tell me they now get 50% plus of all listings in their neighborhood because of our marketing materials! Walk your neighborhood twice per year, create compelling online content, submit articles to local publications, and/or advertise in neighborhood newspapers, send out newsletters and be the one to consistently educate your community on the local real estate market. I feel great about sharing these strategies with you for a very simple reason: if we can help you become more successful in your business then ReaMark will be more successful in our business. Call one of our Marketing Specialists today at 1-800-932-2957 and we will work with you to create a real estate marketing plan to help you meet your budgets and sales goals! I hope this letter has been helpful, confirmed the efforts you are already making or inspired you to call us. If I can help, please don’t hesitate to call me directly. Name recognition is important for real estate professionals. Your name is part of your brand. Building a recognizable brand creates trust within your community. How can agents build name recognition that eventually generates sales and commissions? First, realize that networking, marketing and name recognition all work together. Done properly, using this triad ensures people know who they can trust when it is time to buy or sell real estate. Here are eight ways real estate agents can establish name recognition in their communities. 1. Become the go-to person for your chartered local association of REALTORS®. If you don’t have a local chapter, take the lead toward forming one. 2. Stock up on pocket-sized business cards, refrigerator magnets or pens. Never miss an opportunity to introduce yourself, and hand out your contact information. 3. Get caught volunteering. Images in the local paper of you ladling soup at the local shelter, or handing out water during the charity 5K, go a long way toward building your brand – without investing marketing dollars. Since the giving season is just around the corner, this might be a good time to designate your office as a drop-off point for a Toys-for-Tots drive, or host a giving tree in your lobby. 4. Offer to write a guest blog for local builders, lenders and other industry connections. This concept is why items like customized memo boards and recipe calendars are so popular. Update your print and online content that adds value with no strings attached. Think real-time weather and traffic updates added to your website or social media channels. Print media updates might include names and contact numbers for city officials. 6. Speaking of providing value, make sure your social media posts aren’t all about the priced-right-two-story-home in the perfect neighborhood. Share content that teaches people ways to make their life happier, easier or more convenient. 7. On social media, share-worthy contests and quizzes are a great way to expand your brand. Host a photo contest where viewers vote, or maybe create a quiz that tests followers’ home buying knowledge. 8. Build relationships with local and regional influencers. You know who these people are. When they talk, everyone listens. Look for online and on-the-ground community members. Remember, you want to form long-term relationships that complement each other, no one wants to always be on the giving end. Building name recognition is all about making an emotional connection with your community. ReaMark customer service agents can help you explore customized promotional material that seamlessly complements your marketing and networking strategies. Real estate agents are constantly looking for new ways to farm for new leads. While word of mouth, signage and networking are effective ways to build a base of potential customers, nothing beats effective direct mail strategies as a way to keep the pipeline of buyers and sellers fresh. Why Use Direct Mail to Farm for Leads? Direct mail is a proven approach that has been used for decades. Even in the digital era, receiving valuable information in the mail, along with some advertising for those needing real estate services, creates an impression that can linger for those who receive the materials. Consistent and persistent direct mail strategies also help to drive insights and information about where your best customers are, how they respond to different appeals or products, and how to better reach them. By fine-tuning your messages and products that are a part of your direct mail outreach, you can better use your marketing dollars to reach the best customers. What’s more, direct mail helps build awareness about you, your agency and your services. Very few of us buy on first glance. Over time, as we begin to develop an understanding of a product, service or brand, we gain a deeper understanding of how a particular provider can best serve our needs. Direct mail is a great way to help create that long-term awareness. How Does Direct Mail Help Get Your Message Out? Message – What are you trying to convey? Options can include your experience, your areas of expertise, knowledge of local markets, reputation. If you offer quick closings, serve a niche market or live in the community, you may want to focus your message on those particular attributes. Similarly, don’t try to cover too much at once. Instead, make sure people know what you’re offering, who you are and how to contact you. Length and Frequency – How long will your direct mail campaign run? You want to keep your message consistent and deliver it several times, but you also want to be sure you hit people enough times that the message sticks. Response Rates Understanding – Typical response rates for your real estate direct marketing campaign is important. The first direct mail piece may have a very low response rate but patience is a virtue. The more awareness you provide, the more likely you are to get calls or responses to your follow-up efforts. What Are Good Real Estate Direct Marketing Ideas? At Reamark, we offer a full range of products to make your direct marketing campaign more effective. 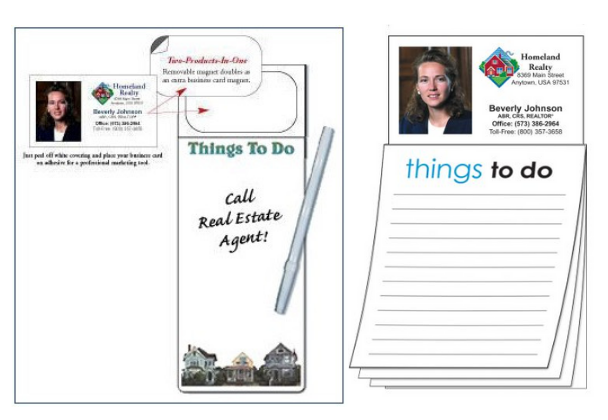 Whether it’s full-color postcards, real estate newsletters or calendars, we offer prompt turnaround to get you products you need. We offer online and print catalogs with thousands of products and titles to keep your message fresh and eye-catching. To learn more about how Reamark can help with your marketing needs, contact us for a free catalog! Many underestimate the positive impact a direct mail campaign can have on their business. With the increased popularity of paperless marketing methods and social media marketing, this is understandable. However, direct mail is still a powerful weapon in your marketing arsenal if you approach it correctly. Read the following Do’s and Don’ts of direct mailing to use this old-school marketing method effectively. The 40/40/20 rule of marketing is still applicable even when it comes to direct mail. Your rate of return is dependent on three main factors. Some 40% is based on the effectiveness of your mailing list, 40% is based on the quality of your offer and 20% is based on the design, text and the overall look of your mailing. In order to get a good rate of return from your direct mailing campaign, you have to create a well-designed mailer. Otherwise, your recipients will likely skim over your ad, not giving it more than a cursory glance. To prevent this, ensure you give plenty of attention to the design of your mailer. Create an eye-catching headline and bold colors to make your mailer stand out. Don’t blanket an area aimlessly as this is a great waste of money. Instead, use your resources to discover the most effective areas to target in your direct mail campaign. Many businesses make the mistake of focusing only on the material they send, which is important, but in so doing they neglect to properly identify their ideal audience. The end result is a wonderful piece of marketing material being put into the hands of people who won’t take action on it. If you don’t already have your ideal farm chosen, you can discover them through testing. Send out a small number of mailers and keep a close eye on the rate of returns from them. This allows you to tweak your intended audience until you have the ideal farm to target. Be sure you can back up anything promised in your mailer. If you say, “we will sell your home in three months,” make sure that’s a reality. Otherwise, tone down your promises. Your readers will see through overblown fluff and exaggerations, so make sure you can back up what you say. Follow the above Do’s and Don’ts in order to construct an effective direct mail campaign. Visit ReaMark today for a full range of products to consider for your next direct mailers. Hello! I’m Richard Brown, president of ReaMark. I have been in direct marketing for over 30 years, with the last 18 years helping professionals like you substantially increase their listings, sales and, ultimately, their income. There has never been a better time to increase your business with a regular contact strategy to anyone who knows you and can refer clients. All signs are pointing to a steady rise in the real estate business since interest rates are at record lows. In addition, inventory of homes are still low so listings are being sold quickly and for top dollar. What has been proven time and time again to be the Golden Truth’s of success? What makes a top agent? One glaring fact I couldn’t ignore is that my business only makes money if the programs we recommend to you make you money. After much thought, I came up with four things you should be doing if you are serious about increasing your yearly income. Over 50% of your business should come from referrals. If you are not mailing your contact list you are losing money. You contact list should includes anyone who knows you, your friends or your family. The larger the list the more successful you will be. You really need to sit down and put this lists into a workable database. Announce your success! Since referrals are the largest part of your business and you want to build up your contact list, these marketing postcards are the second most effective tool at your disposal. You should mail the entire neighborhood and also your current contact list. If your budget is strained these could be part of your planned monthly but for better results you should be doing these mailings in addition to your contacts. The beauty of direct marketing is that is affordable and trackable. If you have 400 contacts then you could be mailing them twelve times per year for as little as 47 cents each or $188 per month. One sale and you pay for the entire year. A business with no prospects will die. You need a reliable consistent source of leads. Since most consumers perceive all real estate professionals to be pretty much the same, you must find ways to differentiate yourself. I get calls every day from customers thanking me two years later telling me that they now get 50% plus of all listings in their neighborhood. Walk your neighborhood twice per year with door hangers or notepads, submit articles to your local paper, become an advertising sponsor on a community podcast, create a neighborhood newsletter of community events or post educational videos about the local real estate market to your social media. I feel great about sharing these strategies with you for a very simple reason: if we can help you become more successful in your business then ReaMark will be more successful in our business! Call one of our Marketing specialists today at 1-800-932-2957 and we will help you develop a plan to meet your budgets and sales goals. I hope this letter has been helpful and has either confirmed what you are already doing or inspired you to call us. I am always available to help. Please don’t hesitate to call me directly. As we head into the fourth quarter of 2017, it’s time to make plans for the upcoming year. If you are like most real estate agents and brokers, you’ll be looking to getting the biggest bang for your marketing buck and ReaMark is here to help with our 2018 wall calendars. It’s time to order from our proven effective selection of calendars. Here are six tips as to why Reamark calendars are both a powerful marketing tool and a cost-effective way to reach customers and prospects. Offering calendars to customers leads and prospects during the fourth quarter gets them “first in home” which is important for calendars. These first calendars are more likely to be kept and displayed. Ordering calendars too late in the season can make you appear to be a “Johnny come lately” when it comes to promotional products. Calendars provide valuable information for families for 12 months or more. They are put on walls, displayed on refrigerators, desks, and in wallets for a full year giving you valuable visibility for an extended period. That is value! 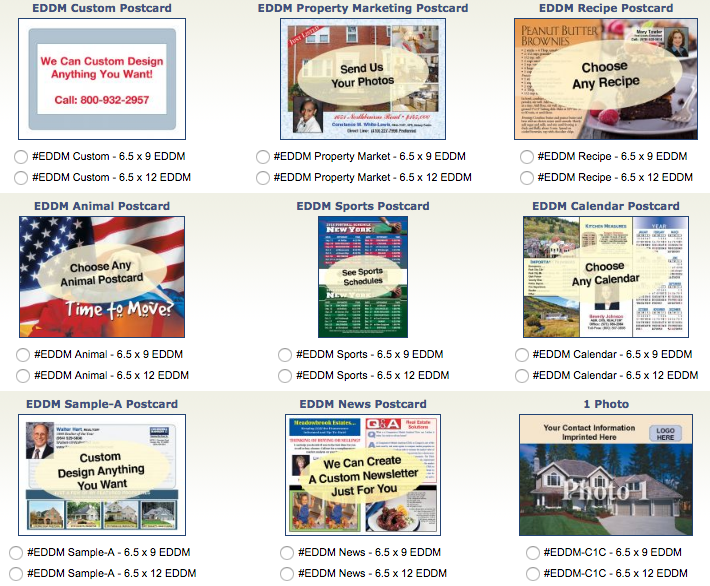 At ReaMark, we have over 300 different designs of real estate calendars in 10 different styles. This means you can choose a design and style to best fit your message and how you want to brand your business. Want a customized edition? Our professional team can help with your message and graphics! While some real estate items are throwaways, calendars are appreciated by those who receive them. They help families plan for vacations, schooling, and celebrations. They place your name front and center every time they are looked at. Many real estate professionals have built their business on real estate marketing calendars. It is a staple of their marketing plan each year. As new agents move toward more digital marketing, it increases the value of a tangible item like a calendar. You can even combine the two, offering calendars to those who respond to your email or social media marketing! Now is the time to act as we are offering 2018 wall calendars at terrific savings during our New Year Sales Event. 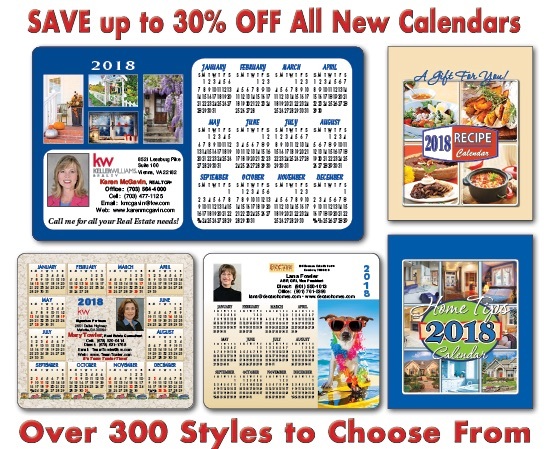 You can save 20-30% on everything from our magnetic calendars to our desk and 2018 wall calendars. Deck the walls, refrigerators, desks, and wallets this season with a selection of real estate marketing calendars from ReaMark! Successful agents and real estate brokers are often successful because they are in a constant search to do things better, more efficiently, and more effectively. This includes marketing. Some have found success in using internet marketing. Others swear by Every Door Direct Mail (EDDM). Still, others have discovered just how powerful the combination of EDDM and online marketing can be. Using EDDM and internet marketing together can create a lead generating machine! In these days where credible information has increasing value, about 56% of people believe that a printed piece is more trustworthy than other forms of advertising. Additionally, 70% of us find direct mail more personal than digital communication. EDDM can also target a specific neighborhood or zip code you may be farming. With Americans receiving less mail each day, your printed piece will stand out more. These six aspects can supercharge your online efforts. Make sure each printed piece includes how prospects can connect with you online at their convenience. Provide a sign-up for a quarterly newsletter through your online marketing. Give readers a choice of a direct mail or digital edition. ReaMark offers a variety of easy to compile printed newsletters that can be digitized. Use EDDM to “tease” more information that may be on your website. “See how much houses are selling for in your neighborhood by visiting us at our website”. “Compare your home to our current online listings”. Use EDDM to promote your willingness to answer real estate related questions on your social media. This will spur discussion on a variety of topics with you serving as the expert. Use it to promote your blog if you have one. Create a contest that is promoted both online and through EDDM. Use the emails you gather to build your contact list. At ReaMark, our team of real estate marketing professionals can help you with EDDM pieces that can effectively funnel people to your web presence. Choose from calendars, postcards, door hangars, magnetic business cards, even seed packets! Make the most of all your available marketing options with a combination of online and direct mail marketing with the help of ReaMark. If you work in a competitive real estate market (and who doesn’t! ), you have to make the most of your resources. You should try to get the most out of each lead, every prospect, and each listing. Sure, you would like to turn a listing into a sale, but with the right real estate marketing products, you can also turn a great listing into new business. At ReaMark, we can help! Here some some terrific, proven ways to maximize a single listing and turn it into more business. 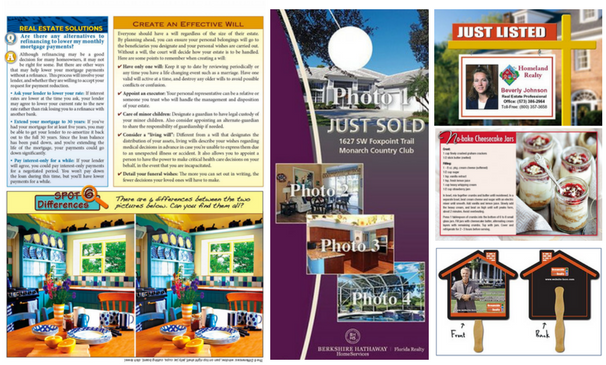 “Just Listed” postcards – These build your brand in a target area using some of your best photos of the listing. Promote learning more on the website or encourage contacting the listing agent. It also demonstrates both the agent and the market are active. Quarterly Newsletter – By highlighting the property in a quarterly newsletter, you can draw attention to an area you are farming and encourage readers to get a free market update. It is also a good place to include testimonials. 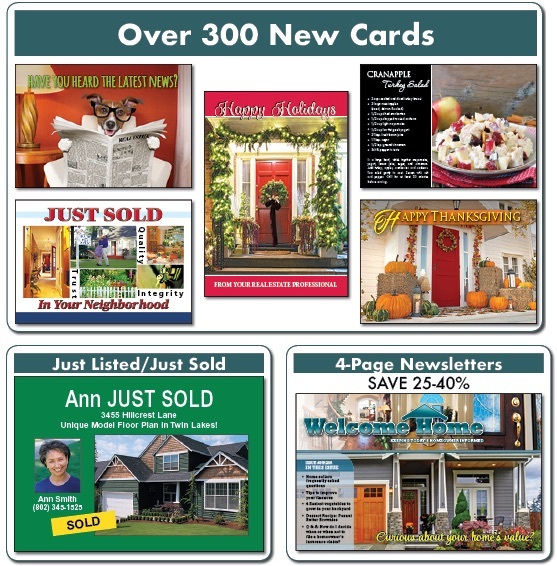 Door Hangers – Door hangers are a cost effective way to show off a special listing. Remember, like so many of our products, our door hangers are customizable! “Just Sold” postcards – Highlight just how quickly a property sold and include a testimonial from the seller. Include a call to action inviting readers to find out more about recently sold homes in the area by visiting your website or calling the agent for a free home evaluation. Thank You Cards – Send thank you cards to the seller with the additional mission of asking them for a testimonial and referrals of friends or family who might be thinking of buying or selling. Contact ReaMark today and talk with with a customer service rep and one of our professional designers. 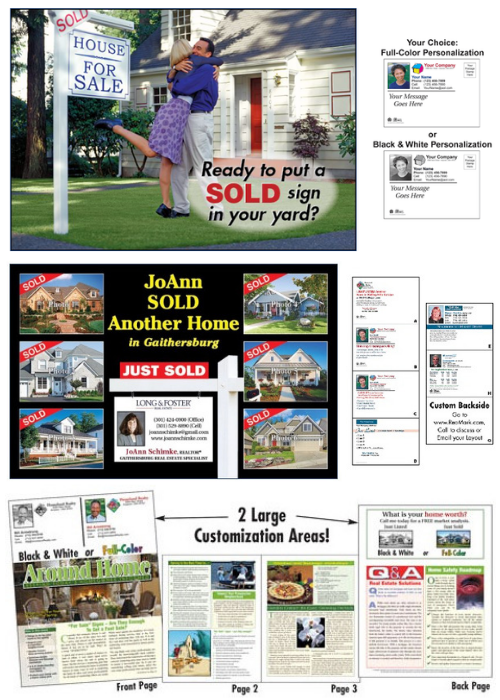 We’ll help you select powerful real estate marketing products that will work to build leads, listings and sales! 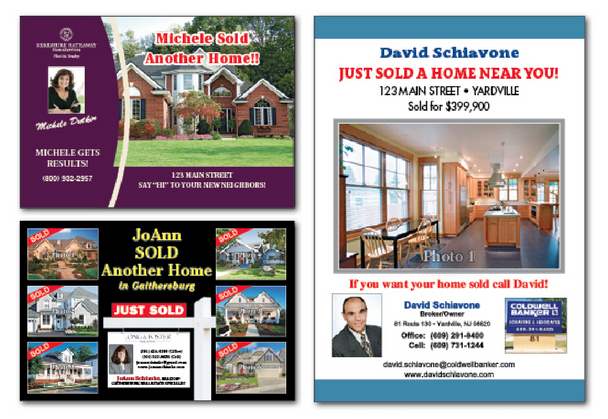 Effective real estate marketing and promotion is what we do! Real estate season is upon us and now is the time to make the most of it at ReaMark.